Blade discovers that Xarus (the son of Dracula) has killed Dracula and is now slaughtering every vampire slayer! 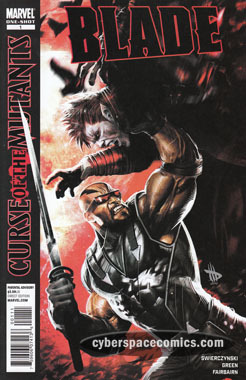 In an attempt to stop the new lord of vampires, Blade assembles a team of twelve remaining slayers to take on Xarus and his army of vampires. Unfortunately, for our heroes, they’re outnumbered by at least 8 to 1 and the only one to make it out alive is Blade. Afterwards, the “daywalker” moves to San Francisco because he fears Xarus’ next move is to convert an army of mutants into vampires. This was kind of an inconsequential addition to the Curse of the Mutants storyline. Yeah, a bunch of characters got killed off – but were they important? Nope. In fact, I don’t remember seeing them in any of the other previous Blade series (and there have been five of them). So, they may have even been created just for this story – which certainly didn’t have enough room to make us care about eleven of them. Our main hero made it out alive – that’s what really matters to anyone reading this book. And, we know the villain’s next target – the X-Men (although if you’ve been reading any X-book recently, you probably already knew that). And, finally – while the cover looks excellent – the interior art leaves a lot to be desired … especially for a regular-sized comic priced at $3.99.